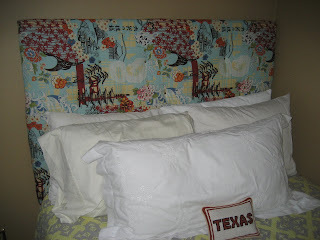 Last summer, I shared with you my fabric headboard that we made for the guestroom. I still stand by the cuteness of the Alexander Henry "Koto" fabric. I went back to JoAnn and found this faux-linen/burlap-y outdoor-ish fabric that was wayyyy more neutral (and cheap). Also, we still had leftover tacks to nail in from the original headboard-making extravaganza. Sister came over before Christmas and helped me completely clean out this room before our holiday company came. We were in there for hours. So long, in fact, that you can actually now see the floor...in the whole room. The headboard was that day's finishing touch. Got the red and oatmeal throw pillows at JC Penney (and my alma mater pillow from Santa a few years ago). Also, if you're ever looking for Euro sham inserts, the cheapest I found was at Tuesday Morning for $7.99. Holla! Thanks, Sister, for your help organizing and recovering this headboard. It definitely "works" much better. I just love those cheery owls! Thus, if you're considering making your own headboard, do not do as I did: pick your bedding first! btw, if you want my haphazard instructions, go to the previous post here. ooh, love it! the previous fabric was definitely cute, and the new bedding has a similar feel. so fun! Will you help e decorate my Chatham townhome as well? I am STRUGGLING with my spare room! super cute! I love the cheery owls myself. Cute, cute, cute! It is so fresh, fun, and cozy looking all at the same time. I love it! It looks great! Love the new bedding! Very cute headboard. The color of the fabric with the bedding are very fun and bold. Good for you! I love the old fabric but think that the new one is very soothing and I love the finished product. Great job.